"All the world's a stage, And all the men and women merely players: They have their exits and their entrances". So begins a monologue in William Shakespeare's As You Like It. However for Shakespeare himself it seems that his plays and sonnets have provided him with a more permanent place in hearts and minds throughout the world. 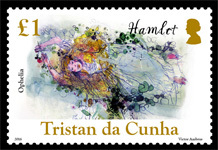 He is widely regarded as the greatest writer in the English language and the world's pre-eminent dramatist. 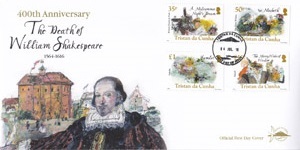 To mark the 400th anniversary of his death Tristan da Cunha and Ascension Island have commissioned Victor Ambrus to illustrate a series of atmospheric postage stamps depicting some of Shakespeare's more colourful characters from the three dramatic genres of comedy, tragedy and history. When William Shakespeare died in 1616 he left an unparalleled legacy. Not only to the development of drama and literature but to our very language, thoughts and ideas. His works are timeless and such was his ability to touch upon human nature that the magnitude of his influence can still be felt in the ways that we think and feel. Very little is known for certain about Shakespeare. What we do know about his life comes from registrar and court records, wills, marriage certificates and his tombstone in Holy Trinity Church, Stratford-upon-Avon. He was the eldest son among 8 children. As his father was a public official we can be confident that the young William Shakespeare would have gone to school, although not to University it seems. The emphasis at the time was on Latin and classical history, providing him with ideas and characters for some of his later plays. By 1582 his father had lost most of the family fortune and Shakespeare, then 18, married his pregnant girlfriend Anne Hathaway, the daughter of a wealthy farmer. By 1591 he had penned his first play, the trilogy Henry VI which achieved modest success. Stratford was often visited by troupes of actors and it was probably these players who sparked his interest in the stage and perhaps provided the contacts for him in the London theatres. In 1592 he became a partner in an acting company and had already written plays in the three dramatic genres of comedy, tragedy and history. By 1599 Shakespeare and his partners had built their own theatre, known as The Globe, and as his fortunes grew he was able to write uninterrupted with some 37 plays attributed to him. During this period the English language was going through a period of change. Words from the traditional Greek and Roman languages together with those from other Countries brought to England through wars, exploration and diplomacy were all being added to the English language. Shakespeare was adopting these words and if necessary simply making others up. Indeed he is credited with introducing some 3,000 words to the English language. As a result Shakespeare popularised many words and phrases that are still widely used today, such as "Wear your heart on your sleeve" (Othello) and "There's the rub" (Hamlet), "dead as a doornail" (Henry VI) and "fancy free" (a Midsummer Night's Dream). Whereas his father lost a small fortune William Shakespeare managed to amass considerable wealth during his lifetime. By the time of his retirement to Stratford a few years prior to his death aged 52 he was the owner of several properties. As with much of his life the cause of his death is not known, but a diary entry of Holy Trinity Church's vicar John Ward indicates that Shakespeare might have celebrated a little too hard one evening and died of a fever! In 1623, seven years after Shakespeare's death, John Heminge and Henry Condell (two actors from The King's Company that Shakespeare has been part of) had his plays published. This First Folio contained 36 plays and sold for £1. Although 18 of his plays had already been published 18 others, including Macbeth and The Tempest, were only found in this folio. 35p - Bottom, Titania and Puck from the play A Midsummer Night's Dream. This comedy was written in the 1590's and has proven to be one of Shakespeare's most popular plays for the stage. 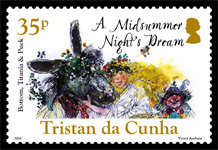 Titania, the fairy queen, falls in love with Nick Bottom (a labourer) who has been given the head of a donkey by Puck (a mischievous elf) who feels it is better suited to his character. 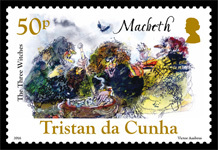 50p - The Three Witches from the tragedy Macbeth. "The Scottish Play", is believed to have been written between 1599 - 1606. It is Shakespeare's shortest tragedy and tells the story of the brave General Macbeth who receives a prophecy from three witches that he will one day become king. His ambition leads to murder, guilt, madness and death as Scotland descends into civil war. £1 - Ophelia from the play Hamlet. The play was written between 1599 - 1602 and had certainly been performed by 1602. One of only two female characters in the play Ophelia would in happier times have been a potential wife for Hamlet. However when Hamlet unknowingly kills her father Polonius it provokes a fit of madness and ultimately leads to her untimely death. £1.20 - Falstaff from The Merry Wives of Windsor. 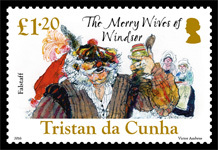 First published in 1602 this comedy features the character of Sir John Falstaff the fat knight who had previously been featured in Henry IV Parts 1 and 2 as a companion of the future King Henry V. In the Merry Wives he has become the buffoonish suitor of two married women. It was one of the first Shakespearean plays to be performed once the theatres re-opened in 1660 after the interregnum (1649-60). FDC - A portrait of William Shakespeare with The Globe Theatre behind.